This is my article I wrote for Preview Gadgets. 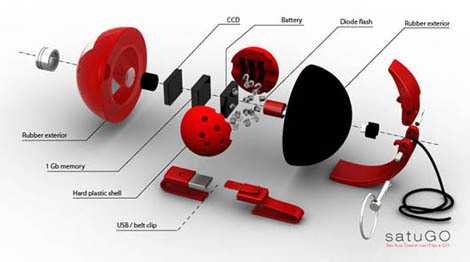 Preview Gadgets is a new Gadget Blog, and u must see it! “See Aim Throw capture and Go” in short SatuGO. SatuGO is based on a simple wish to be able to take more fun and edgy pictures where the photographer is part of the action. SatuGO is bouncing ball and a digital camera. Yes, it is possible. Purpose of this gadget is to make it more fun taking pictures. Throw SatuGo in the air, and it takes the picture when it hits a surface. Set the timer and take pictures from far up in the air. 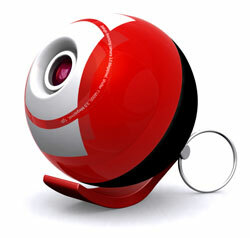 Satugo is about the size of a tennis ball, but it’s not air inside, it’s 3Mpix digital camera. 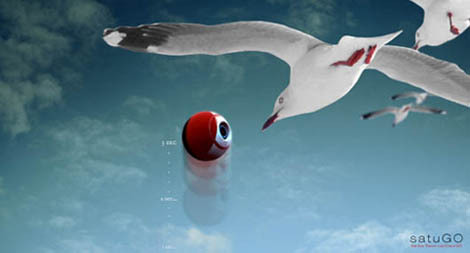 SatuGo can also be used as a web camera or as mobile storage for data. SatuGO is more fun than ordinary camera. The wish is to make the photographer an active part of the picture by throwing the camera into the motive. SatuGo make pretty pictures, it do not have a screen, you have to get to a computer to see what pictures you have captured. You can take pictures by simply throwing it, when it hits the surface he takes a picture. Satugo also has build in timer and flash. To activate flash or timer you need to put the SatuGo in the holder first. Then you have to beat a specific rhythm on either the red or the black rubber part of the ball. If you what to activate the timer, you need to punch seconds into it, the time chosen will be the interval for how often the camera will take a picture. When you take out the camera of the holder, camera starts to take pictures. If you what to see what you have been captured, you need to connect the Satugo with the computer. For this you can use the belt clip. Belt clip also works as a USB connector. What is the best place for using SatuGO ? You can use SatuGO everywhere. Satugo is water resistant and virtually indestructible. It is secured with several protective stratum’s. You can use SatuGo when you are skiing, running or when you are out diving. Of course you can always use SatuGo as a regular web camera while sitting at your desk. Can i buy a Satugo? SatuGO is still only a concept product, and u can’t buy it. Visit SatuGO on web and give your feedback. Interesting concept,that can be taken further to taking aerial photography, Once refined it would reduce the cost of taking aerial photographs significantly. I will be watching this space for developmnets.